The Reserve Officers' Training Corps (ROTC) is a college-based, officer-commissioning program for the armed forces. Its founder, Captain Alden Partridge originated this novel system of education which combined civilian and military studies in order to produce enlightened and useful citizen-soldiers. ROTC is designed as a college elective that focuses on leadership development, problem solving, strategic planning, and professional ethics. In the United States, ROTC produces officers in all branches of the U.S. Armed Forces except the U.S. Coast Guard. ROTC graduates constitute 56 percent of U.S. Army, 11 percent of U.S. Marine Corps, 20 percent of U.S. Navy, and 41 percent of U.S. Air Force officers, for a combined 39 percent of all active duty officers. Graduates of ROTC programs rise to the highest levels of military command, including Joint Chiefs of Staff, such as Colin Powell. Similar programs exist in other countries, some based on the American model while others, such as that of the United Kingdom have their own history which contributed to the design of the program in the United States. The ROTC program is not without controversy. During times when the public opposed war, such as during the Vietnam War, ROTC programs were made unwelcome at a number of educational institutions including Ivy League schools. Supporters regard ROTC, and Junior ROTC in high schools, as valuable not only for recruitment to the military but also as beneficial to the educational experience of participants. Leadership training, loyalty, and readiness to fight to defend one's country have proven valuable qualities in citizens. On the other hand, as humankind advances into a time of world peace, training to use force in solving disputes may become obsolete and not only the ROTC but all military organizations must adjust their focus to peaceful methods of conflict resolution. ROTC in the United States began in 1916 with the passage of the National Defense Act that was intended to increase "preparedness" prior to the American entry into World War I.
ROTC in the United States began in 1916 with the passage of the National Defense Act that was intended to increase "preparedness" prior to the American entry into World War I. One of the provisions of this act was the creation of a Reserve Officers' Training Corps in colleges and universities. It was patterned after the British Officers Training Corps, which supplied most of the British officers in World War I.The Army ROTC commissioned its first class of lieutenants in 1920. Until the 1960s, many major universities required compulsory ROTC for all of their male students. However, because of the protests that culminated in the opposition to U.S. involvement in the Vietnam War, compulsory ROTC was dropped in favor of voluntary programs. In some places, ROTC was expelled from campus altogether, although it was always possible to participate in off-campus ROTC. In the late twentieth century when anti-war sentiment had weakened, concerted efforts began at some Ivy League universities that had no ROTC, including Harvard and Columbia, to return ROTC to campus. However, from 1993, following the introduction by President Bill Clinton of the "don't ask, don't tell" law regarding homosexuality in the armed forces, opposition to the ROTC focused on this issue. After the policy was repealed in December 2010, efforts to return ROTC to campuses gained momentum. In March 2011, Harvard signed an agreement to officially recognize Naval ROTC. 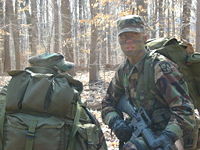 Army ROTC cadets on a field training exercise. There are three types of Army ROTC programs administered in the U.S., each with a different element. The first are the programs at the six senior military colleges, also known as military schools. These institutions grant baccalaureate degrees (at a minimum) and organize all or some of their students into a corps of cadets under some sort of military discipline. Those participating in the cadet program must attend at least two years of ROTC education. The second are programs at "civilian colleges." As defined under Army regulations, these are schools that grant baccalaureate or graduate degrees and are not operated on a military basis. The third category consists of programs at military junior colleges (MJC). These are military schools that provide junior-college education (typically A.S. or A.A. degree). These schools meet all other requirements of military colleges and cadets are required to meet the same military standards as other schools, as set by Army Cadet Command. Cadets can be commissioned as second lieutenants in the Army Reserve/Army National Guard as graduating sophomores. Upon commissioning, these lieutenants are required to complete their bachelors degree at another institution (of the lieutenant's choosing) while serving in their units. One difference between civilian colleges and the senior or junior military colleges is the enrollment option in ROTC. ROTC is voluntary for students attending civilian colleges and universities; however, with few exceptions (as outlined in both Army regulations and federal law), it is required of students attending the senior and junior military colleges. Another major difference between the senior military colleges and civilian colleges is that under federal law, graduates of the SMCs are guaranteed active duty assignments if requested. For a cadet who takes only the first two years of the ROTC program (Basic Course), there is no military obligation, unless the cadet is a three-to-four-year scholarship cadet or has other specific scholarships. In order to progress to the last two years of the program (Advanced Course), the cadet must contract with the United States Army, electing to serve on either Active Duty or the Reserves (Army National Guard or Army Reserve). The first year serves as the cadets’ introduction to the Army. Topics covered include military courtesy, military history, basic first aid, basic rifle marksmanship, basic hand-grenade use, land navigation, rappelling, fundamentals of leadership, map orienteering, field training, and drill and ceremony. Military Science II Year (MSII): The second year is an expansion of the topics taught in the first year of the program. Cadets are introduced to tactics, troop-leading procedures, basics of operations orders, and ethics. The third year marks the beginning of the Advanced Course. While non-scholarship cadets may take the first two years with no military obligation, third- and fourth-year students must sign a contract incurring a military obligation to serve Active Duty or in the National Guard or Reserve once commissioned as a second lieutenant. The course sequence in this year is mainly focused on the application of leadership and small-unit tactics. Cadets are assigned rotating leadership positions within the School Battalion and are evaluated on their performance and leadership abilities while in those positions. Third-year cadets practice briefing operations orders, executing small-unit tactics, leading, and participating in physical training, and preparing for successful performance at the five week Leader Development and Assessment Course during the summer following the third year. Attendance at the course is mandatory. 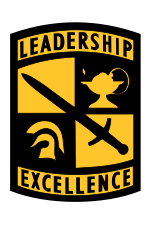 The Leader Development and Assessment Course (LDAC) (formerly Advanced Camp) is a paid five-week leadership course conducted at Fort Lewis, Washington, during the summer. Typically, cadets attend LDAC during the summer between their first and second years in the Advanced Course. At LDAC, cadets take on various leadership roles and are evaluated on their performance and leadership abilities in those positions. Cadets also participate in adventure training which includes confidence and obstacle courses, rappelling, water safety, weapons firing, and patrolling. Cadets must attend and complete this course to earn an Army commission. In the final year of the ROTC program the main focus is towards preparing cadets to become successful lieutenants in the Army upon graduation and commissioning. Senior cadets apply for their branches (career fields) of interest in the fall. Upon graduation, cadets are assigned cadet-battalion staff positions and are responsible for evaluating cadets and executing training operations and missions. The Naval Reserve Officers Training Corps (NROTC) program is a college-based, commissioned officers recruitment tool of the United States Navy and the United States Marine Corps. In 1926, the U.S. Department of the Navy established the Naval Reserve Officer Training Corps. Its purpose was to produce a reserve of qualified officers who would be needed for a possible rapid expansion of the military in the case of an unforeseen emergency. The original units were at the University of California, Northwestern University, University of Washington, Harvard University, Yale University, and Georgia Institute of Technology. In 1932, the U.S. Marine Corps joined the program. Under the modern U.S. Naval ROTC system, graduates become active duty officers rather than reserve officers. NROTC commissions individuals into either the United States Navy as an Ensign or the United States Marine Corps as a Second Lieutenant. While attending college, these prospective officer candidates are known as Midshipmen. Whereas Naval Academy Midshipmen are on active duty, NROTC Midshipmen are in the Naval Reserve, but are on active duty for periods of training during the summer. The primary difference is that NROTC Midshipmen attend an ordinary civilian college or university, whereas Naval Academy Midshipmen attend the U.S. Naval Academy in Annapolis, MD, which is a much more regimented, military environment. The normal, "baseline" service commitment for Scholarship NROTC graduates is eight years, with no less than four served on active duty. The exact commitment will depend on which "community" of the Navy a Midshipman chooses to enter. For example, Navy and Marine pilots are generally committed to eight years after their date of winging. Because the training for a Naval Aviator is extensive, this can lead to a commitment of up to ten years. Naval Flight Officers usually serve a six year commitment and submarine officers usually serve a five year commitment. Non-Scholarship students may serve shorter commitments. 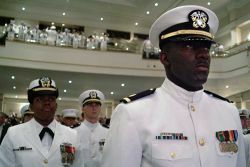 Once a Naval Officer completes his active duty commitment, he must serve the rest of his eight years in some portion of the Naval Reserve. The Air Force Senior ROTC Program is designed to "recruit, educate and commission officer candidates through college campus programs based on Air Force requirements." 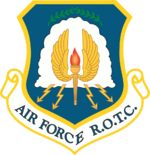 The first Air Force Reserve Officers' Training Corps (AFROTC) (then Air ROTC) units were established between 1920 and 1923 at the University of California at Berkeley, the Georgia Institute of Technology, the University of Illinois, the University of Washington, the Massachusetts Institute of Technology, and Texas A&M University. After World War II, Dwight Eisenhower established Air Force ROTC units at 77 colleges and universities throughout the United States. AFROTC units are called "detachments." Within the detachments the students are organized into wings, groups, squadrons, and flights, mirroring the active-duty wing structure. Furthermore, the cadet wing is separated into two divisions: General Military Course (GMC) consisting of the first two-years of training and the Professional Officer Course (POC) consisting of the last two-years of training. The AFROTC program is divided into two sections: Academic Classroom Program (Aerospace Studies classes) and Cadet Activities (ie Leadership Laboratory, Physical Training, and other training). There are no ROTC programs sponsored by the U.S. Coast Guard. However, there is a Direct Commissioning program for graduates of maritime academies. This is available to individuals who hold a degree from a qualifying state or federal Maritime Academy and hold a Third Mate or Third Assistant Engineer license, or a degree major in Marine Environmental Protection or a related field. Maritime Academy Graduates have education and training that enhances the Coast Guard's ability to carry out its operational missions. Individuals selected serve as Coast Guard Reserve Officers on full-time active duty. In addition, there is one JROTC program that is sponsored by the Coast Guard. The Mako Battalion is based in the Maritime and Science Technology (MAST) Academy High school in Miami, Florida. A Navy JROTC cadet salutes during the parading of the colors ceremony held at Pearl Harbor, Hawaii. The Junior Reserve Officers' Training Corps (JROTC) is a federal program sponsored by the United States Armed Forces in high schools across the United States. The program was originally created as part of the National Defense Act of 1916 and later expanded under the 1964 ROTC Vitalization Act. NJROTC Cadets visiting USS Theodore Roosevelt. Developing good citizenship and patriotism. Developing self-reliance, leadership, and responsiveness to constituted authority. Developing a knowledge of basic military skills. Actively assist cadets who want to enlist in the military [and] emphasize service in the U.S. Army; facilitate recruiter access to cadets in JROTC program and to the entire student body … [and] work closely with high school guidance counselors to sell the Army story. A number of other national militaries, particularly those countries with strong historical ties to the United States, have ROTC programs. Several are described below. The Philippine-based National ROTC Alumni Association (NRAA) estimates that 70 percent of the officer corps of the Armed Forces of the Philippines come from ROTC. During Spanish colonial rule the Philippines created a training course at the University of Santo Tomas similar to what became the ROTC. However, it was not until 1912, when military instruction began at the University of the Philippines, that the first ROTC unit was established there with instruction beginning on July 3, 1922. In 1967, President Ferdinand Marcos made ROTC a mandatory course at all colleges and universities and other institutions with an enrollment of 250 male students. Since 2002, there have been two ROTC options: Literacy Training Service and Civic Welfare Service. ROTC in South Korea started in 1963; while Taiwan created its own program in 1997. The University Officers' Training Corps (OTC) is a part of the British Army which provides military leadership training to students at UK universities. The modern OTC was founded during the Haldane Reforms in 1908 to remedy a critical shortage of officers during the South African War (1899-1902). Initially it had a senior division, in eight universities, and a junior division, in public schools. During the First World War, the senior OTCs became officer producing units and some 30,000 officers passed through, but after the war reverted to their basic military training role. During the 1930s they began to increase in strength and peaked in 1938 during the Munich Crisis, and in the Second World War they again became officer producing units for the army. In 1948, the senior divisions became part of the Territorial Army and women were accepted for the first time with the formation of Women's Royal Army Corps sub units (women are now fully integrated into all sections). The junior division was renamed the Junior Training Corps with the aim of preparing students for National Service. It was abolished in 1960. The UOTC is a University/ College club with a great and varied social life. Each UOTC has its own Officers Mess, of which all Officer Cadets are members, where you can go and relax and where you'll find some of the cheapest drink on campus. It's a great place to unwind after an evenings training. The Officers Mess plays host to wide variety of functions from theme parties to formal dinner nights. The social life is regarded as an essential part of the UOTC. The camaraderie created through the training and lifestyle means that there is a great sense of belonging and this adds to the atmosphere of the social functions. Whether there are a couple of you getting together in a pub, a group returning to the bar after a long day training, or the whole unit enjoying its summer ball there is lots of fun to be had. In 1960, General George H. Decker became the first ROTC graduate named chief of staff of the Army. General Colin Powell was the first ROTC graduate named Chairman of the Joint Chiefs of Staff. He was a graduate of the City College of New York. The University of Oregon has produced the highest number of general officers out of the civilian ROTC schools, with a total of 46 flag officers. ↑ Advocates for ROTC, Homepage. Retrieved February 25, 2009. ↑ Tara W. Merrigan and Zoe A. Y. Weinberg, Harvard Signs Agreement To Officially Recognize Naval ROTC The Crimson Tide (March 04, 2011). Retrieved April 18, 2011. ↑ United States Army, AR 145-1 (Reserve Officers’ Training Corps) (Washington, DC: Department of the Army, 1996). Retrieved February 25, 2009. ↑ United States Code, 10 USC 2111a:Support for senior military colleges, Legal Information Institute. Retrieved February 25, 2009. ↑ Air Force ROTC, Mission and Values. Retrieved February 25, 2009. ↑ United States Army Junior ROTC, "History." Retrieved February 25, 2009. ↑ 10 U.S.C. § 2031. Retrieved February 25, 2009. ↑ United States Army, Chapter 5: Meeting the Recruiting Challenge, United States Army Posture Statement FY01. Retrieved February 25, 2009. ↑ Department of the Army, "Cadet Command Policy memorandum 50," United States Army Cadet Command, Fort Monroe, VA, March 30, 1999. Retrieved February 25, 2009. ↑ Philippine Information Agency, "National ROTC Alumni Association rallies behind PGMA administration," PIA Press Release, March 17, 2008. Retrieved February 25, 2009. ↑ The Ateneo de Davao ROTC History (ADROTH) research project, "ROTC History," ROTC in the Philippines, 2006. Retrieved February 25, 2009. ↑ 12.0 12.1 Army, University Officer Training Corps. Retrieved February 25, 2009. ↑ University of Oregon, University of Oregon ROTC History, University of Oregon Army ROTC. Retrieved February 25, 2009. Collins, Robert F. Reserve Officers Training Corps: Campus Pathways to Service Commissions. New York, NY: Rosen Publishing Group, 1986. ISBN 978-0823906956. Crawford, Alice M., Gail Fann Thomas, and Armando Estrada. Best Practices at Junior Reserve Officers Training Corps Units. Washington, DC: Storming Media, 2004. ISBN 1423586662. Johnson, Charles. African Americans and ROTC: Military, Naval, and Aeroscience Programs at Historically Black Colleges, 1916-1973. Jefferson, NC: McFarland & Co., 2002. ISBN 978-0786413249. Neiberg, Michael S. Making Citizen-Soldiers: ROTC and the Ideology of American Military Service. Cambridge, MA: Harvard University Press, 2000. ISBN 978-0674543126. History of "Reserve Officers' Training Corps"
This page was last modified on 9 July 2015, at 17:11.